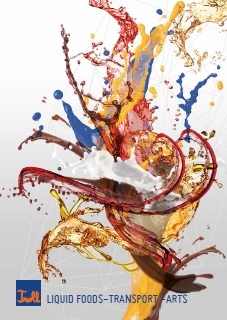 March 2018: We say hello to another advertising partner: TVB Imst! Also in 2015, company Felix Troll invest in safety and modern technology. The new super light Containers and Chassis can load 24.500kg without problems. With this new lightweight technology our transport posibilities are CO2 reduced and more flexible. From 1.1.2014 we will change our location in Imst. New address is Dr. Carl Pfeiffenberger-Straße 14, A-6460 Imst. Telephone and mail remains unchanged! In October 2013, we were able to take three new tanks in the fleet. 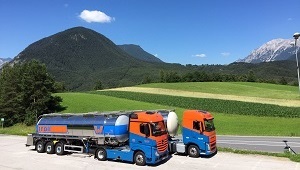 Felix Troll Transport GmbH has been developed into a reliable partner for the transportation of liquid goods. Transport of snow to cool the guests for the largest Beach Club on the Rhine in Köln. 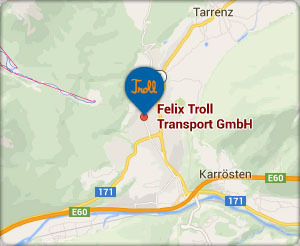 General manager Ulf Schmid has made the brand Felix Troll Transport fashionable again. In March the company Felix Troll Transport GmbH start to drive with two new Mercedes Benz Actros with Emissionclass 6. We loaded at the Rettenbach Glacier in Sölden a refrigerated trailer with snow for Aarhus in Denmark. Since September 2012, we are able to offer 6 new pump trailers.